Phalha seated on a chair in a garden with hollyhocks in the background. 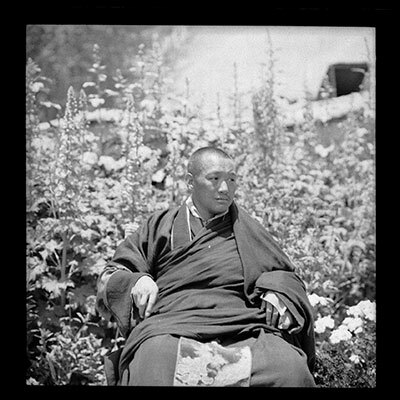 He was the Dalai Lama's dronyer (mgron gnyer chen po) chamberlain and planned his escape from Tibet in 1959. He is wearing monks' robes and felt boots and there is a carpet at his feet. Manual Catalogues - Notes on negative index - Folio 49. 'do' [Phala]. The Tibet Album. "Phalha seated on a chair in a garden" 05 Dec. 2006. The Pitt Rivers Museum. <http://tibet.prm.ox.ac.uk/photo_2001.59.7.50.1.html>.